You have questions about your bad breath issues. We have answers. Use our FAQ page to learn about bad breath, oral health, our zinc ion technology, and which SmartMouth product is right for you. Don’t see the answer to your question? Reach out to us directly through our Contact Us page. Germs? Food? Digestive system? Although these play a role, the primary culprit is sulfur gas. The cause of bad breath, or halitosis, is a naturally occurring process everyone experiences almost every day. Our mouths contain million of germs, and as these germs break down protein particles in our saliva, they produce foul-smelling sulfur gas that we perceive as bad breath. Brushing, flossing, and seeing your dentist on a regular basis are all great avenues towards promoting successful oral health. However, if you still are suffering from bad breath we suggest SmartMouth. It works differently than single-liquid mouthwashes because our patented two-solution oral rinse stops and prevents sulfur gases, which are the real cause of bad breath. When mixed together, SmartMouth’s two solutions, the Sulfur Eliminating* Solution, which destroys sulfur gases, and the zinc-rich Activating Solution, activate to release millions of zinc ions. This zinc ion technology blocks the germs’ ability to ingest protein particles, which stops sulfur gas production and the resulting bad breath. Which SmartMouth rinse is right for me? Why does SmartMouth use 2 solutions? SmartMouth Mouthwash uses a patented, dual-solution technology that requires 2 key solutions to be kept separate until just prior to rinsing. This ensures that SmartMouth is freshly activated with each use to provide unmatched, all day fresh breath. Can I travel with SmartMouth? With the FAA liquid carry-on limitations, don’t forget to pack the new SmartMouth Single Use Packs or 2-Bottle System. These individual-use mouthwash packets fall well under the FAA liquid carry-on limit and fit easily into your purse, briefcase, or carry-on for fresh breath anytime, anywhere. You can also pack an unopened package of SmartMouth Mouthwash into your checked baggage. Please note that you should not travel with previously opened mouthwash bottles. Halitosis is caused by germs that live in our mouth and eat protein and producing foul smelling sulfur gases. Everyone has halitosis at one time or another. Within the past several years, the only 3rd generation halitosis treatment was developed and made available to Americans. Over 9.1 billion dollars were spent in the U.S.A. in the year 2008 on commercial oral care products, with a significant percentage of those monies devoted to prevention and treatment of halitosis. In recent years, there is a growing awareness, in both Medicine and Dentistry, that many health problems throughout the entire body originate in the mouth. There is also an increasing agreement that the gum tissue health in everyone’s mouth may be the primary culprit in the development of these problems. Why is SmartMouth better than other mouthwashes at preventing bad breath? SmartMouth provides fresh breath 12 times longer than any other leading mouthwash because it works in 2 ways: elimination* and prevention. (1) It eliminates existing bad breath when you rinse with it. (2) It prevents new bad breath from forming. The result is 12 hours of fresh breath after each rinse. No other leading mouthwash has been clinically proven to provide fresh breath longer than 1 hour. What will I experience/feel when I use SmartMouth? Your taste buds will be thrilled with the delicious, mint taste of SmartMouth. Unlike most mouthwashes, SmartMouth does not contain alcohol so it does not burn or dry out the mouth. After rinsing with SmartMouth, your mouth and teeth will feel smooth and uniquely clean. In fact, within one week, you can wake up with your teeth feeling smooth and clean (no fuzzy feeling). Can you eat or drink right after using SmartMouth? SmartMouth is immediately effective upon rinsing, and you can drink or eat at any time. However, when rinsing with any flavored mouthwash, you may want to wait a few moments before eating or drinking. This allows time for your palate to naturally become flavor neutral. Do I have to rinse after eating? SmartMouth Mouthwash is effective at maintaining fresh breath even after eating most foods, so additional rinsing is not required. If you do introduce a very strong, food-based odor like onion or garlic into your mouth, you may need to re-rinse to eliminate that new odor. Does SmartMouth work on smoker’s breath? SmartMouth is effective in eliminating smoker’s breath, including cigar breath. As smoking re-introduces strong odor back into the mouth, you may want to re-rinse after smoking. Does SmartMouth work on post-nasal drip? Post-nasal drip provides a natural food supply (protein) for bacteria to consume and produce bad breath gases. SmartMouth is effective in eliminating and preventing the bad breath caused by typical post-nasal drip. SmartMouth Mouthwash is 100% alcohol free. Alcohol is a drying agent, and a dry mouth can cause or worsen bad breath. In fact, there are many challenges to alcohol containing mouthwashes. All of SmartMouth’s oral rinses are fluoride free. While proper oral hygiene is essential to preventing gingivitis, there are many other factors that can influence whether or not you’ll get gingivitis. These include age, nutrition, tobacco use, infections, diabetes, and more. Use SmartMouth Clinical mouthwash twice a day. Other than improving your oral hygiene and diet, this is one of the best ways to eliminate germs and sulfur production in your mouth. Does SmartMouth work for dry mouth? Yes, SmartMouth’s Dry Mouth formula combines dry mouth relief and bad breath prevention in a never-before-seen way. Where can I buy SmartMouth? You can buy SmartMouth toothpaste, oral rinses, mints, and travel packs at over 60,000 national and regional retail locations as well as purchase them on Amazon. Is SmartMouth safe for kids? Yes! SmartMouth is safe and recommended for children 6 years and older. All the ingredients used in SmartMouth products have been established by the FDA as “GRAS” (Generally Recognized As Safe) and considered safe for use in non-prescription, over-the-counter, oral care products. Is SmartMouth safe for diabetics? Yest! SmartMouth is safe for Diabetics. All the ingredients used in SmartMouth products have been established by the FDA as “GRAS” (Generally Recognized As Safe) and considered safe for use in non-prescription, over-the-counter, oral care products. Is SmartMouth safe to use if I’m pregnant? While we are unaware of any known health concerns with the use of SmartMouth while pregnant, it is recommended that you consult your doctor before using this or any other over-the-counter or prescription mouthwash. All the ingredients used in SmartMouth products have been established by the FDA as “GRAS” (Generally Recognized As Safe) and considered safe for use in non-prescription, over-the-counter, oral care products. Can bad breath be cured? Bad breath is a naturally occurring part of everyone’s life, so it can’t be cured per-se, but it can be prevented by blocking sulfur production by the germs in our saliva. 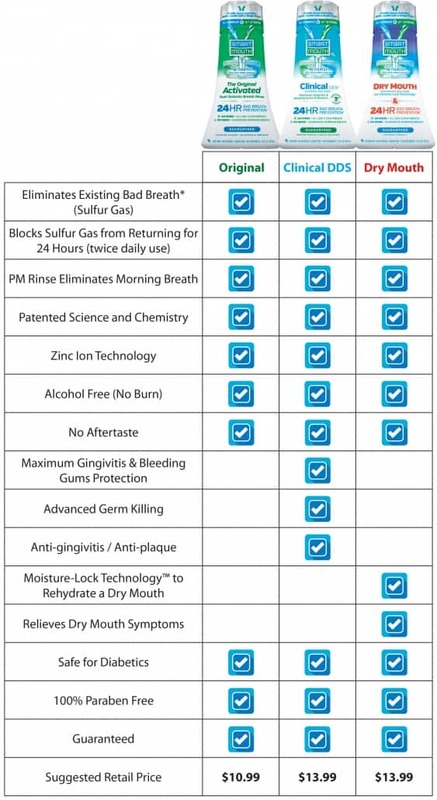 All of SmartMouth’s oral rinses provide 12-hour bad breath prevention with every rinse. Which medications cause bad breath? This is just a small list of the commonly prescribed medications associated with dry mouth and bad breath symptoms. However, always check your medication’s side effects to be sure. How to prevent dry mouth while sleeping? Saliva is important to maintain the health of your teeth and mouth. If you frequently have a dry mouth when you sleep or when you wake up in the morning, try rinsing with SmartMouth Dry Mouth or chew SmartMouth Dry Mouth Relief Mints. Can dry mouth cause cavities? Dry mouth or xerostomia is a dryness in the mouth, often associated with a change or reduction in salivary flow.The saliva in our mouth helps to wash away food debris and reduce plaque. When dry mouth occurs it can cause cavities and tooth decay. That’s why it’s always helpful to rinse with SmartMouth Dry Mouth twice a day. Can dry mouth be cured? The symptoms of dry mouth can be reduced, if not eliminated, by rinsing with SmartMouth Dry Mouth Oral Rinse twice a day. What toothpaste is good for gum disease? When looking to prevent gum disease and gingivitis, you should look for a toothpaste with proven oral health benefits, like SmartMouth Premium toothpaste. Products like SmartMouth Premium toothpaste provides enamel strengthening, anti plaque, anti cavity, as well as sensitive whitening benefits. Which toothpaste kills the most bacteria? SmartMouth’s Premium Toothpaste uses zinc ion technology in conjunction with other premium features to provide enamel strengthening, anti-plaque, anti-cavity, sensitive whitening. An effective toothpaste needs to work subgingivally, meaning it can reach the difficult area between your gums and teeth. Which mouthwash kills the most bacteria? All of SmartMouth’s oral rinses eliminate and prevent the production of sulfur gas caused by the germs in our saliva for a full 12 hours per rinse. What mouthwash is good for bleeding gums? SmartMouth’s Clinical DDS provides optimal oral and general health without sacrificing any of SmartMouth’s elite anti-bad-breath-technology. However, you should consult a dentist if you experience the following symptoms after use: bleeding gums, gums that are tender or swollen, persistent bad breath. What mouthwash do dentists use? Dentists will use and recommend a multitude of mouthwashes for their patients. It’s best to avoid mouthwashes with alcohol and use a mouthwash that is free of parabens.